A mother and son argued about the boy getting a near-failing grade in school; shortly after the disagreement, the mother is dead. Authorities believe the 15-year-old son killed his own mother. A Florida sheriff said early Saturday that the boy, Gregory Logan Ramos initially claimed that he came from school to discover their house ransacked with his mom nowhere to be found inside, while her van was still running in the driveway. The cops were not convinced with the boy’s statement, and when further questioned, Ramos confessed his horrific crime. The teen admitted that he strangled his mother, 46-year-old Gail Cleavenger, late Thursday night. 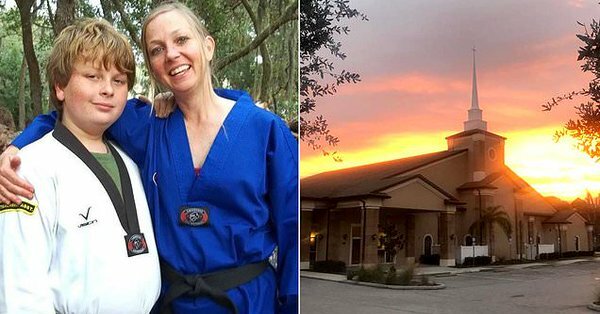 Ramos said he used a wheelbarrow to load his mother into her van and bury her beneath a fire pit at River City Church in DeBary, just northeast of Orlando. Ramos got a “D” in school and got into an argument with his upset mother over the failing grade. The teen was further upset his mother called his father, who was out of town on a business trip. The son also confessed that he got two of his friends to help him pull off the supposed burglary. Those teens, both 17, are Dylan Ceglarek and Brian Porras. Police say they they are also facing multiple criminal charges. Deputies found property that was taken from the house for the “staged burglary” including computers and other electronics including a Playstation 4, a rifle and other items. They also recovered a shovel and broom that were used in disposing Cleavenger's body. I wish I could make my family forget I ever existed. My mom used to scream at me all day everyday. The only things that kept me alive is knowing I was going to leave at 18 and that her bad health will get the better of her.